More than 1.3 billion people worldwide lack access to electricity. 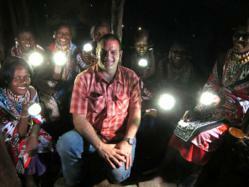 Instead, the world’s energy poor use kerosene, candles, wood, cow dung and other traditional fuels for lighting. Nokero International, LTD is a social innovator whose solar products are bringing power to the powerless in over 120 countries around the world. Nokero invents, manufactures and cooperatively-distributes high-quality, low-cost products such as solar light bulbs, solar phone battery chargers, and solar-backup lights. Steve Katsaros, Chief Inventor and CEO, will present a business plan to accelerate the growth of Nokero to meet the demand of the more than 1.3 billion people who lack access to electricity. These "powerless" consumers spend over $38 billion dollars a day on lighting, burning up 30% of their income. Nokero has sold 400,000 lights in just 2 years, changing lives by replacing dangerous, expensive and unhealthy kerosene lamps in over 120 countries. Nokero solar light bulbs and mobile phone chargers are effective power and lighting solutions for consumers at the bottom of the pyramid. The remaining hurdle is last mile distribution, and Nokero products provide a compelling social and economic return on investment for potential partners. Nokero’s distributors earn healthy margins and access to ongoing dealer support. For the end-users (our distributor’s customers) our products save them tremendous amounts of money. Example, in a study with the Government of Mexico, un-electrified households who replaced their candles with a Nokero solar bulb saved an average of $0.80 USD per day. The breakeven was 12 days at full retail prices, making funds available to families for life improving activities like education, and to businesses for extended hours and increased revenues. The GSBI empowers social entrepreneurs to grow financially sustainable organizations that create value by lifting people out of poverty, utilizing self-sustaining community practices, and developing affordable and appropriate solutions. Using our proven mentor-guided approach, GSBI Silicon Valley combines online and experiential capacity-building exercises over a 10-month period.